Picture postcards from 7 Lakes Country Park in Lincolnshire. 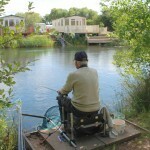 Set in scenic woodland in Crowle, North Lincolnshire, and surrounded by fishing lakes, 7 Lakes Country Park offers a vast selection of holiday homes. Owners can take advantage of the private fishing and watersports available at the park, ranging from a peaceful sail to full throttle water skiing and wakeboarding. The largest lake is the 40 acre Clearwater Lake which is used for water sports while the rest of the lakes are reserved for fishing. Elsewhere on the park, the Lakeside Bar & Restaurant serves food seven days a week and the Bar 7 is also open daily, with big TV screens for live sports events, plus evening entertainment. 7 Lakes is also the venue of the annual Rescue Day, which showcases the invaluable work of the local emergency services through live demonstrations. Organised by Humberside Fire & Rescue Service, 7 Lakes and Humberside Police, the Rescue Day raises public awareness of safety issues such as the dangers of open waters, road safety and fire prevention. Rescue Day 2016 will be held on Saturday July 9 at 7 Lakes.